Divorce is a nerve-wracking experience and full of critical decisions that affect numerous people. In addition, the legal process is mysterious and overwhelming to the average person unfamiliar with its procedure, and the sensitive nature of divorce often serves to increase anxiety about what to expect. One aspect that is particularly concerning to many divorcing spouses is interacting with the judge. The judge is in an obvious position of authority, and holds the power to make significant decisions in the lives of both parties that are difficult, if not impossible, to undo. However, knowing what to expect in advance of any interaction with the court should reduce unease, and cut down on the likelihood a party in a divorce case would do something impermissible or unacceptable to the court. The vast majority of judges are reasonable, and want the parties standing in front of them to find an amicable solution to their problems. Unfortunately, poor examples of judicial behavior exist as well, which is seen in the recent resignation of a Broward County circuit judge following an outburst in the courtroom, during which the judge berated a wheelchair-bound woman to the point of tears. Such an occurrence is rare among judges, but there is still protocol that needs to be followed, and a discussion on the best way to approach interactions with a family court judge will follow below. 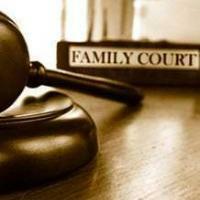 Family court judges are the representatives of the judiciary that handle all matters related to domestic issues. This area encompasses a wide variety of issues, but most parties will encounter the court for matters arising from divorce, child support, child custody, and domestic violence. Unless there are a number of contested issues, or domestic violence is present, which results in numerous motions filed with the court, most family court cases are settled in one to two hearings. The limited number of hearings a party in a family court case can expect to attend means he/she has few chances to make an impression. Thus, an individual should want to make every effort to leave the judge with a favorable view of him/her, especially if the judge is difficult or seems hostile to the case, a party, or a particular position. when the judge does address the client, he/she should stand, start any response with “sir” or “ma’am,” and strictly answer the question asked without argument. Further, during the hearing, always address the judge when speaking, and not the other party or attorney. Finally, direct communication with the judge outside the presence of the other party is prohibited in all but a few cases. Working with an experienced family law attorney will make navigating the issues described above much easier and clearer. Appearing before a judge in a family law case is bound to produce anxiety, but the experienced attorneys at All Family Law Group, P.A. can help guide you through this crucial juncture in your case, and bring the results you deserve. Contact the Tampa divorce attorneys and family lawyers at All Family Law Group, P.A. in Tampa Bay for a consultation at no charge. They can be reached at 813-672-1900.